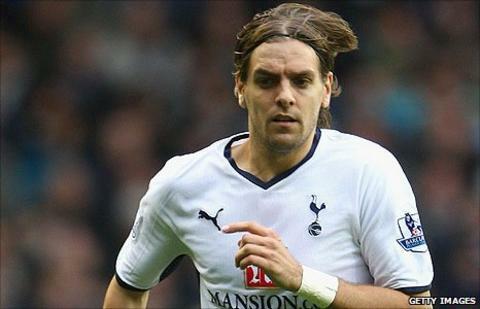 Jonathan Woodgate has signed for Stoke City on a free transfer. The former England centre-back, 31, was released by Tottenham at the end of last season and has agreed what is "effectively a pay-as-you-play deal", according to Stoke manager Tony Pulis. Pulis said: "We believe that if his fitness is managed properly, he will play games for us." "I was thrilled when Tony Pulis asked me to come and join the club," commented Woodgate. "It was important for me to work hard on my fitness during the summer because I wasn't sure where I would be playing and I knew that would decide my future. "Hopefully I can stay fit now because I feel I still have a lot to offer at this level. "With the back-up from the medical and sports science department which they have here at Stoke, that can only help my prospects of doing that. "I'd spoken to him [Pulis] a couple of times about the progress that Stoke have made over the past three seasons and his plans for the future in aiming to build on that success." Pulis added: "The lad is a top-class player and it's been well documented that he has had his injury troubles. "We know that other Premier League clubs were keen on signing Jonathan, so we are delighted he has chosen us. "It's a chance we are taking, but one we were keen to take because of the stature and quality of the player. "We've effectively taken him on a pay-as-you-play deal, which just shows how desperate the lad is to get his career back on the right track." Woodgate, who will trigger a further 12 months on his contract if he plays a specified number of games, has long been considered one of England's finest defenders, but his career has been badly affected by a series of injuries, restricting him to eight caps for his country. He made his professional debut for Leeds in 1998 and was a part of the side which reached the Champions League semi-finals in 2001. He went on to play for Newcastle, Real Madrid, Middlesbrough and Tottenham, but he has continually struggled to remain fit for a sustained period. He made only 65 appearances for Spurs in three and a half years after his £8m move to White Hart Lane from Middlesbrough, a playing record which led manager Harry Redknapp to opt against offering him a new deal this summer. Woodgate's new Stoke team-mates are currently at a pre-season training camp in Austria, and he will meet them when they return home later this week. Stoke chairman Peter Coates told BBC Radio Stoke: "We've taken Jon on a structured deal which is based on playing games. "We think it's a chance worth taking and we're keeping our fingers crossed that he'll play a reasonable amount of games for us. If he does, he's a quality player and it will make it all worthwhile. "It's whether we can manage the injury problems that he's had but he's keen and enthusiastic and if we can get a decent number of games out of him we'll have done very well. "The more he plays the better it will be for all of us because we rate him very highly, and if he hadn't had injury problems, he'd be playing for England."